Finding the perfect property is rare and so the trick is to find the most amount or potential square footage possible in the desired location, and to view the property as an open space with a few ‘structural‘ bones. 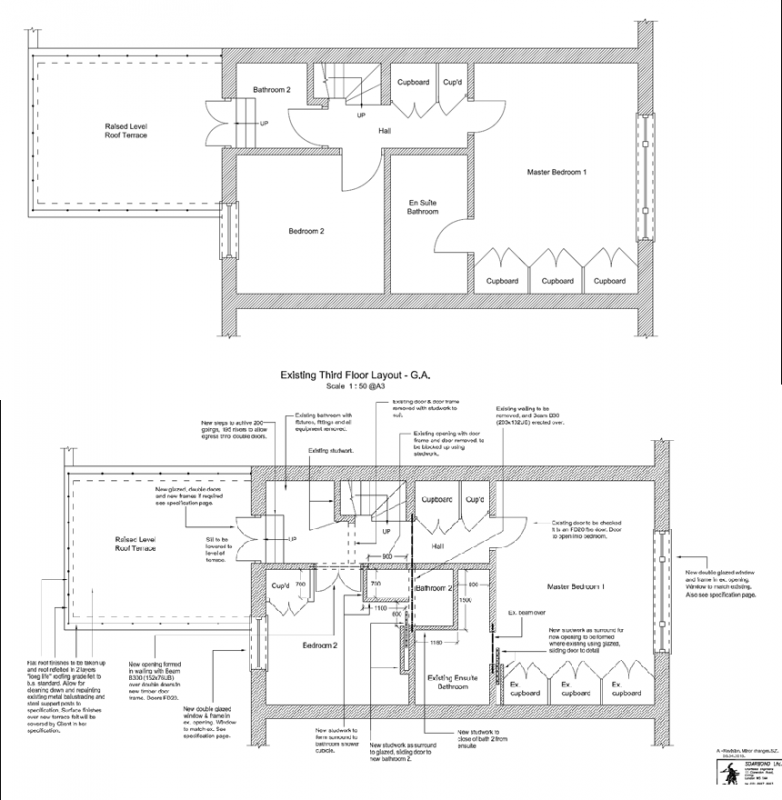 It does help to have experience to draw on, but if you lack the experience focus on the floor plans rather than the photos to help you create your dream home. 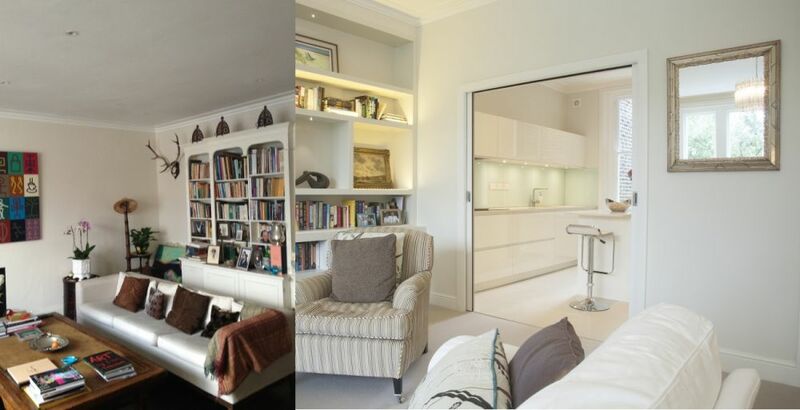 This maisonette is in one of Kensington’s beautiful white stucco villas. Undeniably a great location, and the square footage is just what the client wanted. All it needed was some creative floor planning, unless that is our client wanted to walk through the guest bathroom in order to enjoy the delights of the roof terrace! 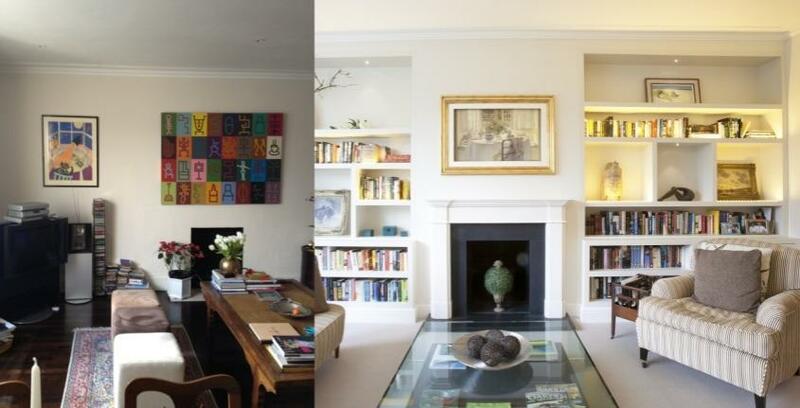 Top of our client’s wish list was lots of light and a wall of books and art. A bespoke bookcase was installed in the living room centred on a marble fireplace, which created a whole new focus to the room. We also opened the wall between the kitchen and the living room using glazed sliding doors, opening onto a beautiful Nicholas Anthony kitchen. 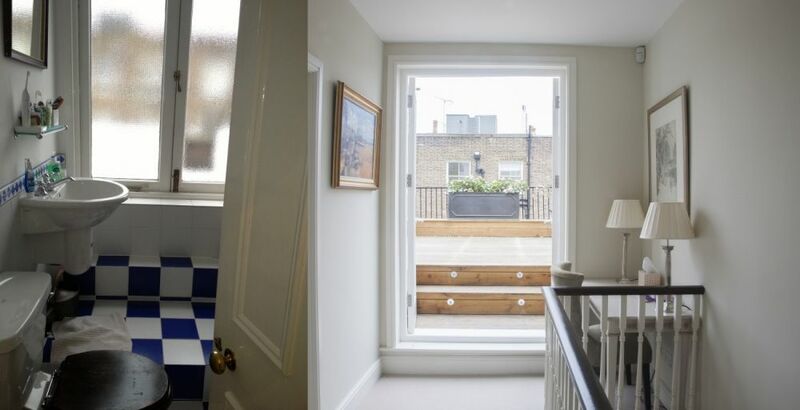 On the top floor, once we had removed the guest en suite we installed glazed French doors and the whole of the top floor ambience changed from a small corridor to light filled spaciousness. To recreate the guest en suite we took a section of the existing master en suite and some of the guest bedroom. This may have made the guest bedroom smaller but by creating centrally located double doors into the room, I hope you agree a feeling of spaciousness remains. The master bedroom is large which gave us the scope to furnish it elegantly and eclectically. Rather than just have a matching pair of bedside tables, we married a bedside table with a chest of drawers from Nordic Style and used a pair of stunning metal lamps from Josephine Home. 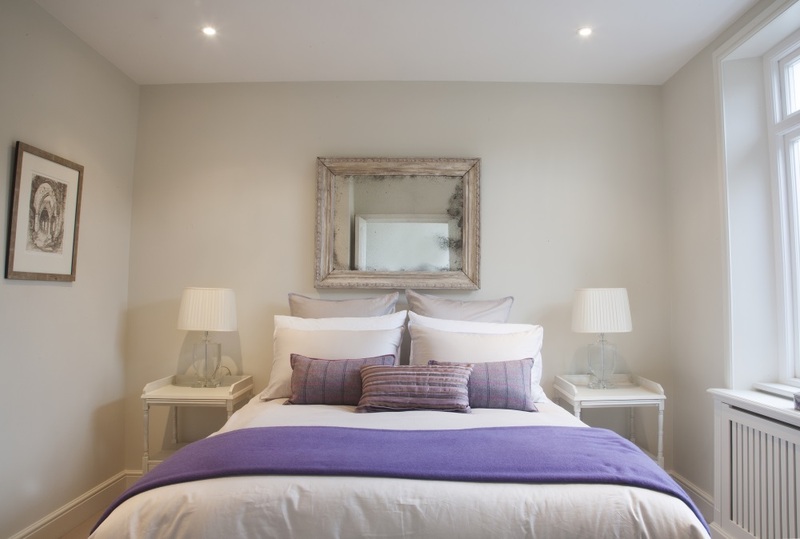 All the bed linen for both bedrooms comes from Josephine Home, whose range of luxury Egyptian cotton bedding is a great favourite of ours. 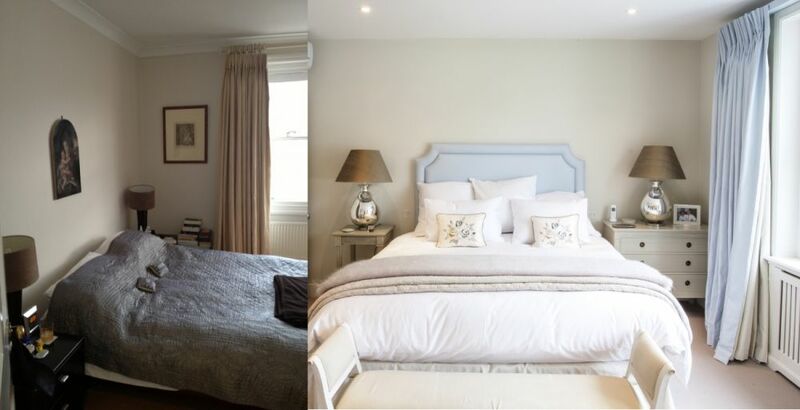 The beautiful ice blue material for both the curtains and the bespoke headboard is from Pret-a-Vivre, a company that not only offers a wide range of materials but also an excellent service of measuring and fitting for your curtains or blinds. The head board was sourced from Robert Langford who offer both standard and bespoke headboards alongside a great range of chairs and sofas. For the final touches we bought two incredibly comfortable antique French chairs which we reupholstered in a textured stripe by Nina Campbell and dressed with some striking Nina Campbell cushions.